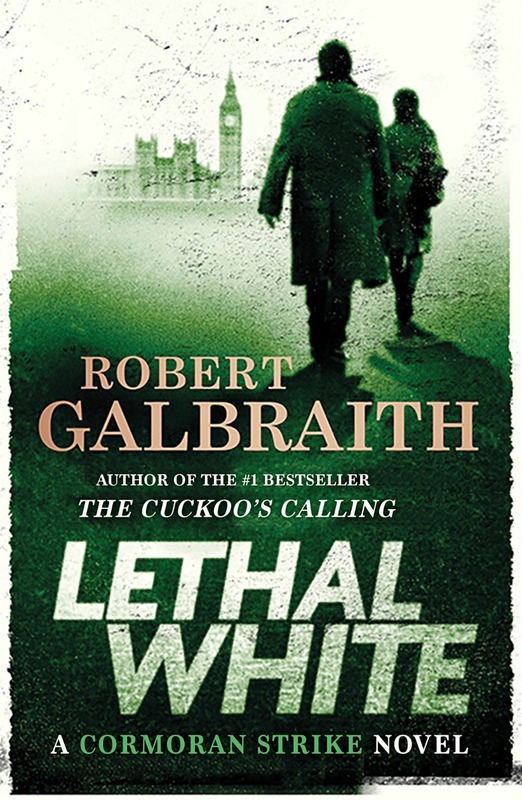 Cormoran Strike and Robin Ellacott investigate a convoluted case involving a government minister, an unreliable memory, murder and blackmail in Robert Galbraith’s LETHAL WHITE. The story picks up where we left off in CAREER OF EVIL, at Ellacott’s wedding. We see a deeper exploration of Cormoran and Robin’s fraught relationship as they each struggle with intensifying feelings, and how it could impact their partnership at the agency. Matthew’s continued opposition to Robin’s job, and perhaps more so, his resentment of Robin and Cormoran’s rapport, exacerbates the situation as a whole. Meanwhile, Cormoran is left unsettled after a troubled man named Billy bursts into his office to share a tightly held secret—as a child, he witnessed a kid being strangled. This revelation sends Cormoran deep into a rabbit hole, involving a new client, Culture Minister Jasper Chiswell, who is being blackmailed. Before too long, Robin and Cormoran are caught in a tangled web, investigating a murder with a shifty cast of characters eerily connected, each hiding secrets of their own. It’s easy to be drawn into Galbraith’s singular storytelling. As with the Potter series, it feels like falling into a world that’s both fascinating and vivid, but with these books, it’s the gritty, malefic London underbelly. For me, this has been a series I’ve deeply adored, with CAREER OF EVIL as my favorite installment. Although I enjoyed LETHAL WHITE, I admittedly felt some bumps with this one. At 656 pages, it’s quite the behemoth of a novel and it felt unnecessarily so. But perhaps my biggest bump was with the case itself. At times it felt confusing, and it wasn’t as interesting or sinister as what we’d seen with CAREER OF EVIL, for example. So although I enjoyed the book, I wasn’t consumed, obsessed, enraptured by it. After waiting for three years, I yearned to be so. I loved exploring that taut dynamic of Robin and Cormoran’s relationship, however. They have such amazing chemistry whether it be on a case or in the potential of something more. Galbraith has written such depth and nuance into the characters, that they feel as real as real can be. And because of these wonderful personas, combined with Galbraith’s writing prowess, I’m highly optimistic about the next installment… I only hope it comes sooner than the last.